THIRTEEN - The #shwishlist - A weekly edit of my favourite items.. This week I have been really busy organising shoots for next month. On one appointment at a Fashion PR I made new contacts and had the opportunity to explain how my blog works and why I started. I went through my professional story - which you can find in more detail here - and discussed at length how one of my priorities is to highlight the small but fabulous independent retailer and brands. As a part of my day job I consult small brands on their businesses, providing an objective view and concise organisation. These brands have outstanding quality and beautiful products but one problem they face is their size and budgets. They are unable to advertise in national magazines, have little time to spend contributing to social media and these stunning pieces, that are made in the UK, are thrown over for bigger designer brands owned by conglomerates. Naturally my work styling involves many designers which are household names and I am not saying they shouldn't be seen as regular readers will know I am a dedicated Chanel fan, however I do think more publicity should be given to products made in the UK, especially when producing on British shores mostly incurs a higher production cost. 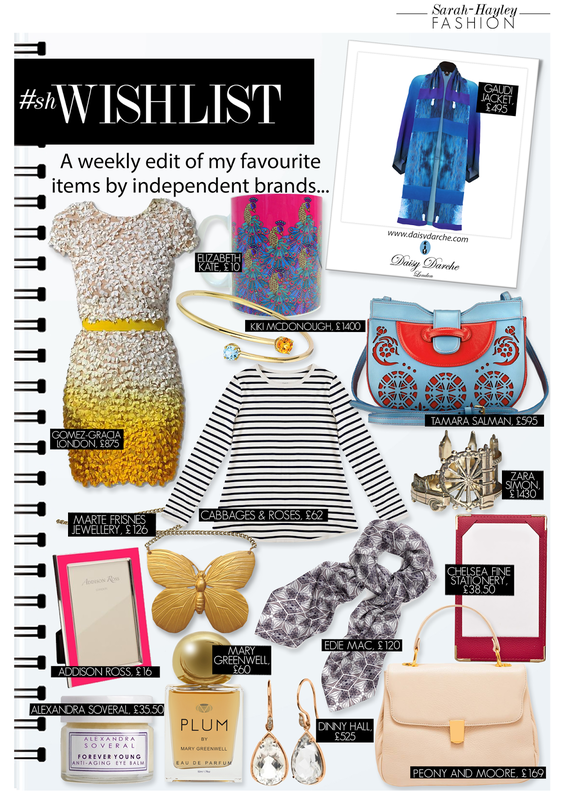 Last year I realised although I have sought to shine a light onto everything I love, from the highstreet to designers and independent brands I hadn't made one piece dedicated to independent brands and that's how #shwishlist began. Three months later I am pleased to bring you my 13th wishlist, full once again with perfect products. One of my favourite pieces is this exciting Daisy Darche jacket made from 100% silk. It is a wonderful timeless piece which you will wear for years to come and suitable for all occasions. I would style with a fitted white summer dress and belt the jacket at the waist. Zara Simon's intricate jewellery is a work of art. The London ring 'London' depicts the wondrous skyline with icons such as a black cab nestled in between the towers of Big Ben and London Bridge. The piece is made to order and takes between 6-8 weeks to make. I love this graphic print silk scarf by Edie Mac. The label launched this season offering collections made from lightweight silks and exclusive prints. The thirteen piece contemporary womenswear collection includes maxi dresses, mini dresses, kimonos and soft tailored separates. All made in England and from 100% silk. I have discovered another fabulous stationer. Next time you need a party invitation or a quality leather notebook look no further than Chelsea Fine Stationery, who have produced affordable personal stationery for thirty years. I love the personalised handbag jotter, great for occasions when you have a smaller handbag or clutch bag but need something to save that all important phone number or email address. Elizabeth Kate previously worked as a freelance designer before starting her own label in 2011. Her scarves are printed with unique images from magical landscapes to imaginative dreams, creating a fantastical wearable accessory. In addition to the scarf line, Elizabeth Kate has also created a homewear line and I have fallen for the Pink Peacock mug. During the Spring/Summer season I opt for a light leather bag and the Peony and Moore 'Camilla' top handle bag is a classic choice. The brand, based in Somerset, established in 2009, creating luxurious leather handbags with classic British detailing and most importantly functionality.